Youth development was the focus of the first event staged by the Barbados Olympic Association Inc. to celebrate International Day of Sport for Development and Peace (IDSDP). 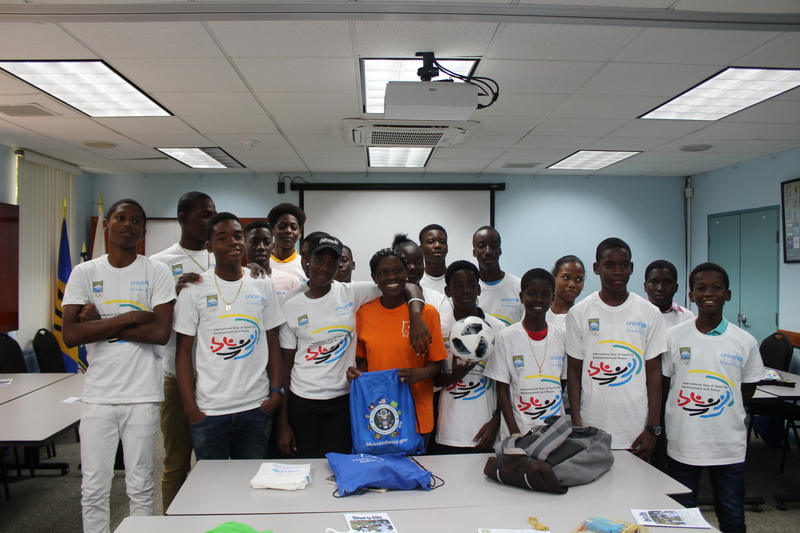 The workshop held at the Barbados Olympic Association Inc. headquarters in Wildey St. Michael on Tuesday, is the first of three events geared at empowering youth to live positively, arming community leaders with strategies to further develop their programs and bringing communities together for peaceful fun activities. Opening the meeting was newly appointed Director of the National Olympic Academy, Vaneisha Cadogan, who told the students that she wanted them to remember two things about peace. “Firstly,” she said, “peace is inside of you so you have to live it, and secondly, when you live it, it radiates from you.” Cadogan made the point that this was one of the values of sports, it helps to develop and engender peace. The 20 students were exposed to a number of team building activities and heard from a number of experts including Paulavette Atkinson of the National Council of Substance Abuse who spoke about 'Dealing with Peer Pressure'. Barbados Football Association, Technical Director Ahmed Mohamed shared his story of how he went from being on the streets to an elite footballer, coach and now technical director. He gave insights into how to become a PRO and how a good mental outlook and dedication plays a big role in achieving success. Well-known nutritionist, Esther Selman taught the students how to have good nutrition on a budget, and representations from the A Ganar program brought the workshop to a close with exercises on conflict resolution. The IDSDP activities continues on Thursday with the community leaders’ workshop and on Saturday with the Multi-Sport event at Whitehall Playing Field. The IDSDP is hosted by the BOA with support from the Barbados Lotteries, the US Embassy and UNICEF.